Where would the loner protagonists of grim, post-apocalyptic fiction be without their loyal sidekick dogs? Don Johnson had a pooch named Blood, voiced by Tim McIntire, in A Boy And His Dog. Mel Gibson had Dog in Mad Max 2. And Will Smith had Sam in I Am Legend. Yes, these flea-and-tick-bearing animals are definitely a staple of the strange, depressing genre. For those addicted to the Fallout games, however, there is only one name in post-apocalyptic sidekick dogs: Dogmeat. 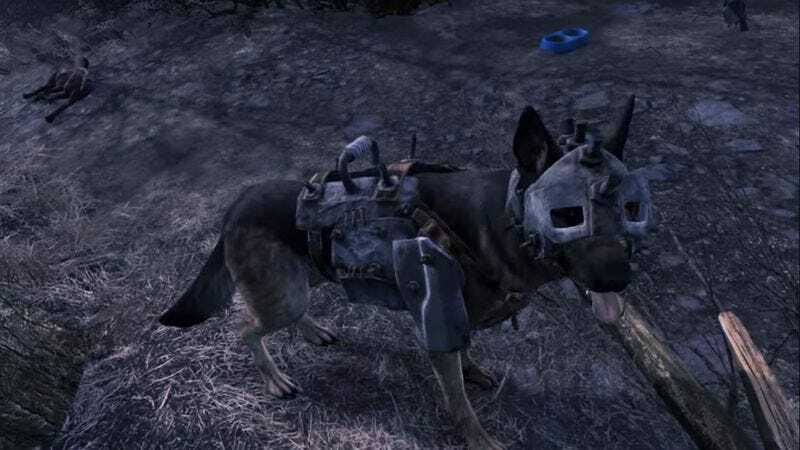 The recently released Fallout 4, the latest entry in an 18-year-old gaming franchise, has continued the series’ tradition of giving the main playable character an optional canine companion as he or she traverses a dangerous, debris-strewn wasteland. And, really, what kind of heartless monster would say no to a dog, especially when companionship of any kind is in short supply? For anyone on the fence, however, the ever-resourceful nerd rocker Bonecage has paid tribute to the four-legged character in song, with some assistance from the like-minded Mr. Gee, who actually has an entire YouTube channel devoted to Fallout-related songs. “Dogmeat (A Fallout 4 Song)” is three and a half minutes of snarling, guitar-drenched bad assery extolling the virtues of the fictional cur. “He’s a good boy,” goes the chorus. “Found me a shiny new gun. And I love that mangy mutt.” The musician does acknowledge that owning a dog is a big responsibility but is ultimately more than worth the trouble. “Even though he occasionally gets in the way,” Bonecage writes, “Dogmeat is a good boy. He brings a bit of love and comfort to the otherwise nightmarish landscape of Fallout 4.” What more could you expect from a pet?